Computer users are like Harley riders. I know this sounds far fetched but if you think about it this statement has a lot of truth in it. A large amount of computer users buy parts for their computers because they are shiny or carry a brand name, just like Harley riders. For a lot of people in both groups it’s not about the performance of the machine that guides their purchasing decisions but the amount of bling for the buck. 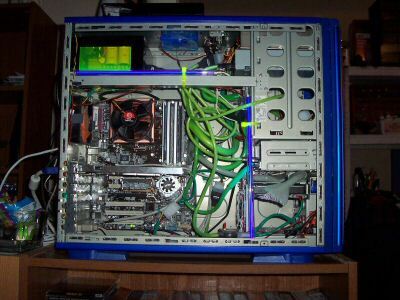 There is nothing wrong with buying bling for your system as long as you know that’s what you’re buying. The Thermaltake Mini Typhoon comes packaged in a blister case which really shows off the very nice finish on the copper. Included are clamps for AMD K8 and M2 processors, as well as the Intel LGA775. The instructions are clear and in color and a packet of generic heat sink paste is included. I would suggest dumping the generic paste and using Artic Silver to get a bit more thermal advantage. 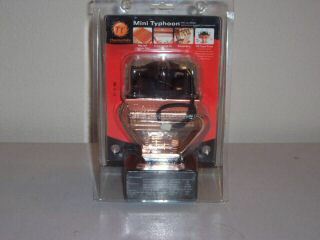 Installation is simple and I had the Mini Typhoon installed and the system fired up within a 15 minuet period. The clip for the AMD board could use some improvement. 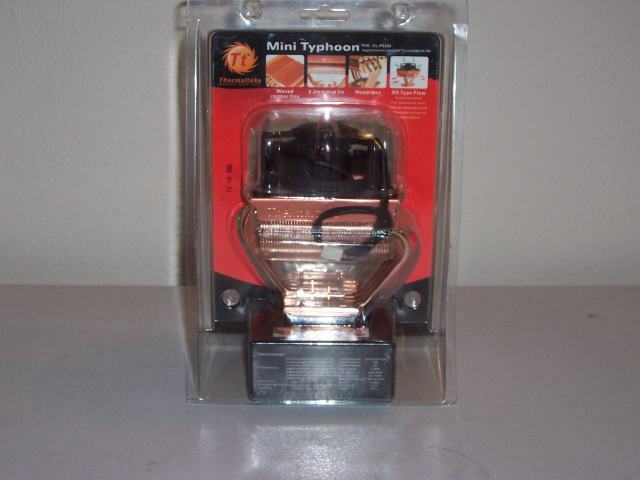 It does not secure the Mini Typhoon as well as it should and it allows it to slip a bit from side to side. 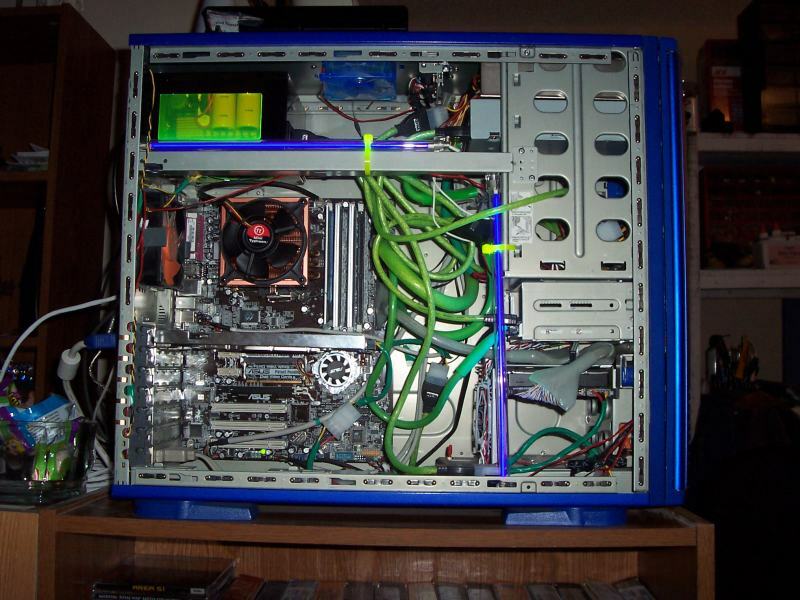 To create the load conditions I ran the same tasks for both heat sinks. I was downloading six music files while uploading six music files. This was done in the background while playing Rome Total War on max settings for one hour. 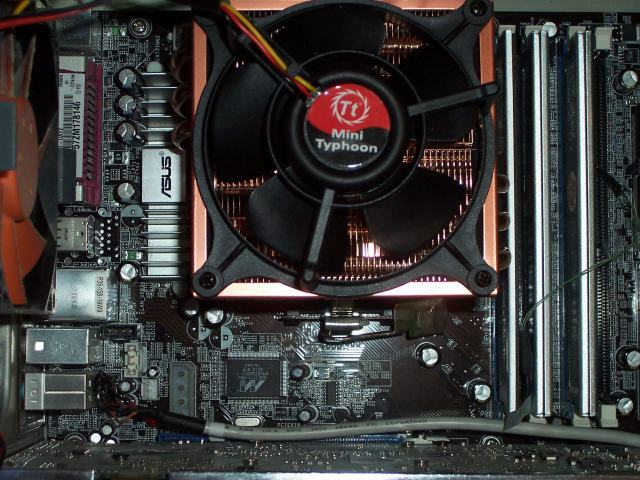 Surprisingly, the temperatures I recorded after installing the Thermaltake Mini Typhoon were only minimally better under load than the stock AMD heat sink. However the Thermaltake Mini Typhoon outperformed the AMD heat sink at idle speed. I should point out that to avoid clearance issues with my window mounted fan I had to remove it when installing the Mini Typhoon. 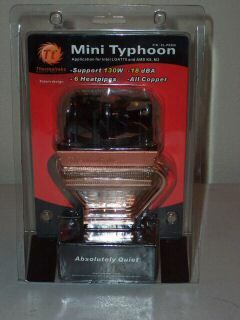 Although this might affect the results of the Minis temperatures I believe the effect would be minimal. 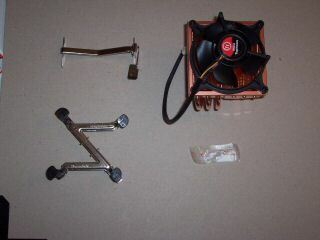 As you can see the Mini Typhoon is 5 degrees Fahrenheit cooler than the stock AMD heat sink at idle temps. However there is only a difference of 2 degrees Fahrenheit at load temps. 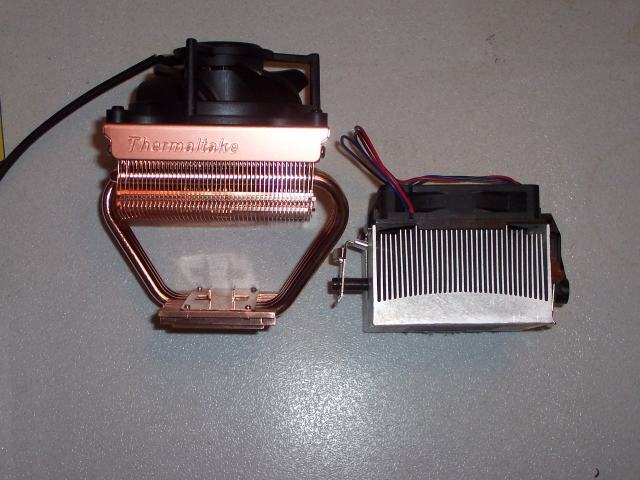 At the time I am writing this review I do not have a price for the Mini Typhoon and I would be hesitant to change out my stock heat sink and spend the money for such a minimal gain in cooling. 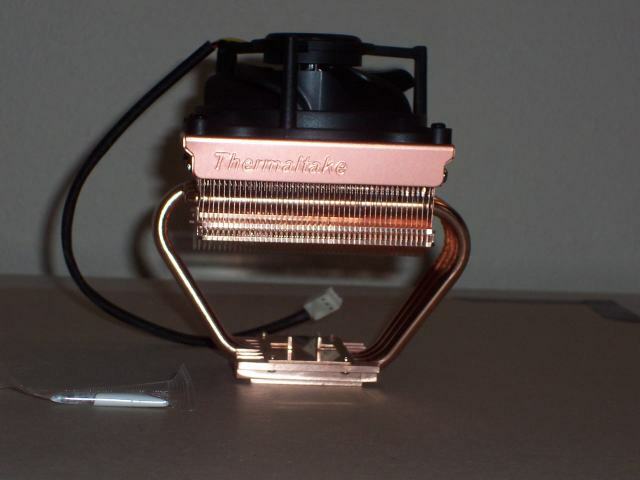 However if you like the bling or if you are building a system and purchased your CPU without a heat sink the Thermaltake Mini Typhoon might be for you. Benchmark results listed were recorded during a 30 minute burn with the highest figures represented from the two cores as reported from TAT and Everest thermal monitors. Also note, these temps are right after HSF installation, waiting to see after 200 hours of use to see if improvment is noted with theArcticSilver 5. Overall, I like this HSF and recommend it! 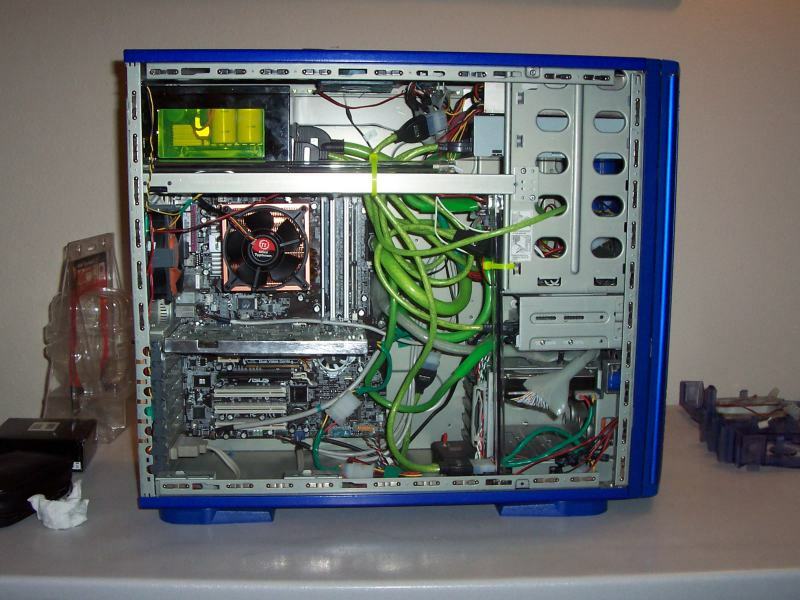 Just be sure to clean the surfaces right and make sure the plastic pegs for the Intel LGA775 applications are "set-in" fully. It can't be installed on Intel 965XBX mobo. One of heatpipe will hit the heatsink of one VRM, once the holder is locked to the mobo. 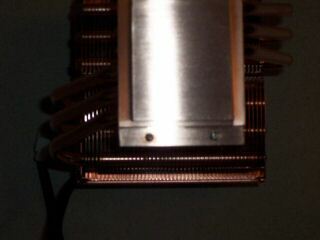 Also its copper base may touch one of small capacitors near the socket. I purchased this product and have had an extremely difficult time getting it to firmly connected. 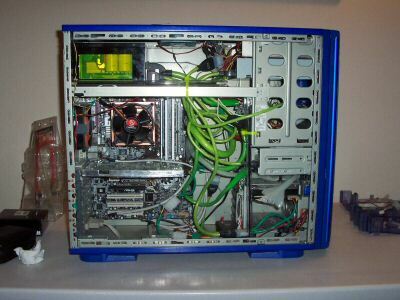 I may have even damaged my motherboard. Perhaps I am an idiot, but i have spent over 3 hours working on this and it still won't remain stable. THe instructions are some of the worst I have EVER seen (which is saying something).